We are presenting a range of Gel Ice Packs, which possess properties such as non hazardous and bio friendly, which further makes them applicable in fronts such as preserving the freshness of perishables. HDPE bottle ice pack is an ideal alternative for dry and wet ice transportation and non-permanent storage. Blended with the most qualitative PCM’s Phase Change Material usually non-toxic, can absorb a considerable amount of heat, hence our cool packs are the most effective way for temperature control. These ice packs are more useful than ice gel pouch because of its hard cover which maintain its shape, maintain temperature for longer and less chances of damage. These reusable hard gel ice packs can be reusable. 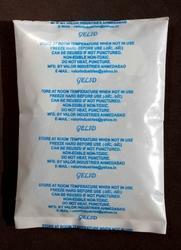 We are manufacturers, exporters and suppliers of GELID® Gel Ice Pack. Offering LDPE Low density polyethylene, reusable gel cool pack in a pouch form; Eutectic Coolant packs are used in coolers to keep perishable products especially meats, dairy products, pharma products, etc. at very low temperatures. These eutectic gel, Pcm ice packs are the most economical way for transporting temperature sensitive commodities viz. sea foods, frozen foods, flowers and so on. Dry Ice Pack is an effective first-aid, passive cooling product. It will be cold at once kept for more than 12 hrs in the deep freezer and then ready to use. 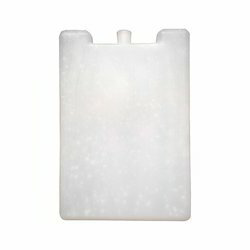 We are offering a wide assortment of Dry Gel Ice Packs that is very potent coolant. Suitable for frozen products, these Ice Packs are consisting of specially formulated Gel. Our experts manufacture them from one of the best raw materials to ensure maximum satisfaction to clients. 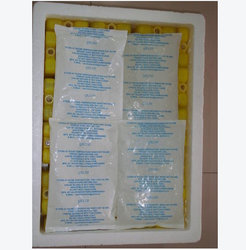 Available in various specifications, these packs are used to make conventional gel ice packs. Our range includes pcm packs, dry gel ice packs, dry ice bags, insulated shippers ice packs, cold chain logistics ice packs etc. Our firm is well reputed among consumers for constantly providing quality Ice Packs. We are presenting a range of Gel Ice Packs, which possess properties such as non hazardous and bio friendly, which further makes them applicable in fronts such as preserving the freshness of perishables. 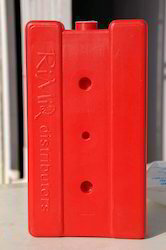 HDPE bottle ice pack is an ideal alternative for dry and wet ice transportation and non-permanent storage. Blended with the most qualitative PCM's Phase Change Material usually non-toxic, can absorb a considerable amount of heat, hence our cool packs are the most effective way for temperature control. These ice packs are more useful than ice gel pouch because of its hard cover which maintain its shape, maintain temperature for longer and less chances of damage. These reusable hard gel ice packs can be reusable. Packaging Details: About 30 pieces in a carton. We are supplier of Gel Ice Packs, which possess properties such as not hazardous and bio friendly, which further makes them applicable in fronts such as preserving the freshness of food products in lunch boxes, coolers, and shipping containers. Ideal alternative for dry and wet ice transportation and non-permanent storage, these can be reused if not torn or punctured. These products rendered by us are reusable PCM packsalso available in several customized form, as per specifications are given by the patrons. Packaging Details: About 30 pieces in a carton or as desired. Our ice gel pouches are non toxic, non hazardous and bio friendly. They are best replacement of dry and wet ice for transportation and temporary storage as they are economic, stay longer and colder than ice. Ice Pouch are the best economically viable alternate to Active Refrigerated/Insulated transportation which is quiet costly. Ice gel packs are readily available in different sizes or you can contact us for customized solutions we provide as per customer specific requirements for different products and usage. Can be reused N number of times, until and unless gel pouch is not punctured or licked. 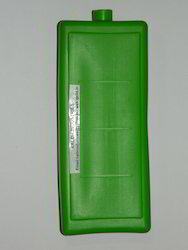 We are manufacturers of gel ice packs in India. 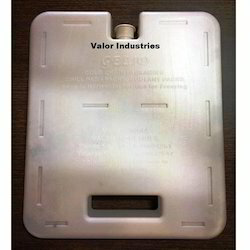 An Reusable Ice Pack, Chill Pads, Plastic Pads or Gelid Freezing Pads are the refrigerant, usually non-toxic, can absorb a considerable amount of heat, since its enthalpy of fusion is high. It is commonly used as a cold compress to alleviate the pain of minor injuries or in coolers or insulated shipping containers to keep products cool during transport. Packaging Details: 4 Pieces in a carton. We have carved a niche amongst the most trusted names in this business, engaged in offering a comprehensive range of Small Ice Pack. Packaging Details: aboot 60 pieces in a carton. 1. Insert hot GELID® Gel Ice Pack into the pocket of the support, and then apply to body. Do not apply directly on the body. 2. Prepare GELID® Gel Ice Pack for hot therapy by following heating instructions. 2. 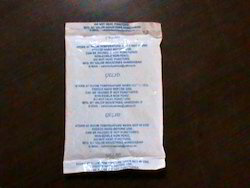 DO NOT BOIL THE GELID® GEL ICE PACK DIRECTLY. 3. Immerse the GELID® Gel Ice Packs in hot water for 8 -10 minutes. 4. Carefully drain the water in the bowl and remove the GELID® Gel Ice Pack with a towel. 5. Test the GELID® Gel Ice Pack first before use. If the unit is too hot let it cool-off before use. 6. Insert GELID® Gel Ice Pack into the pocket of support, and then apply to body.